Infrastructure is most prominent area of concern to promote rapid economic development and take the Make in India concept to next level. Proper infrastructure will be needed to provide the platform for faster, consistent growth and for India to become a major world economic power. 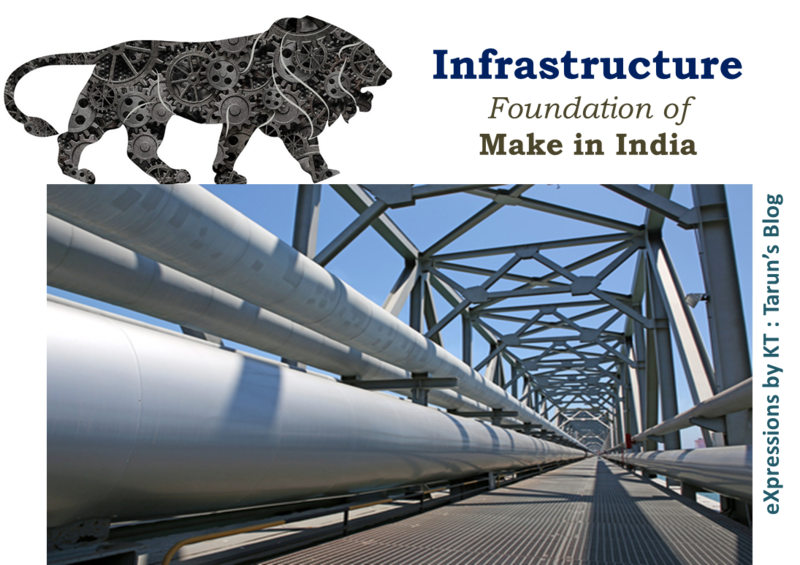 Development of world class infrastructure is must to enhance the competitiveness of the manufacturing sector in India. Most important sectors of infrastructure which need to be concentrated to improve manufacturing competitiveness are ports, roadways, railways and power. India is aiming to achieve a growth rate of 6-8 % over next few years. Such a high growth rate is only possible if enough investment in infrastructure is undertaken. Growth in last few years has already made visible the lack of infrastructure in India. The effects of undeveloped infrastructure are evident in India's congested highways, airports and ports. In times of recession improvement in infrastructural framework gains all the more importance. Proper infrastructural facilities are also important in today’s world of increasing globalization as the foreign investment in directly linked to such facilities existing in a country. The government has realized importance of infrastructure in development of economy and several steps have been undertaken in the direction. India has 12 major ports and 187 minor ports along 7,517 km long Indian coastline. Government of India dominated maritime activity in the past. The National Maritime Development Programme is expected to bring a total investment of over Rs.50, 000 crore in the port infrastructure. Roads carry about 61% of the freight and 85% of the passenger traffic. The rapid rise in international trade and domestic cargo has placed a great strain on Railways. Government has, therefore, decided to build dedicated freight corridors in high-density routes. Majority of Generation, Transmission and Distribution capacities are with either public sector companies or with State Electricity Boards (SEBs). Private sector participation is increasing especially in Generation and Distribution. Sustained increase in the competitiveness is a representative of the economic strength and stability of the economy. Technology has a great impact on the economic growth and development of the country, which is a result of interaction between national and international bodies including governments, businesses, and academia. There is a need for generation, application, transfer and diffusion of technology to the developing countries for improving competitiveness of their manufacturing sectors. Technology also results in value addition in manufacturing. The unavailability of credit facilities forces the small and medium scale industries to finance investment with internal finance, which is very difficult in case of SMEs. And hence they are forced to delay the investment till they have built up the required capital. As a result of poor credit availability, thousands of small and medium scale enterprises have shut down. For sustained economic growth and development of manufacturing competencies government policies are required which allow more participation and attract more and more foreign direct investments in India. High interest rate is one of the main reasons which has restricted the growth of manufacturing sectors and has not only led to increase in the cost of production for manufacturers but also a decline in the demands for their products. Although a lot of steps have been undertaken by the government still their proper and timely implementation needs to be ensured. At the moment, differentiation amongst different elements of infrastructure and prioritizing of those projects that have the most far reaching fall out for the economy need to be done. A proper connectivity of ports to various industrial regions needs to be developed. This is possible by development of proper rail and road infrastructure. The rate of road development in recent years has to be maintained. Implementation of railway projects especially in areas involving large amount of goods movement should be taken up. Power costs need to be reduced from the current high of 8-10 cents/unit by a combination of lower AT & C losses, increased generation efficiency and added low cost generating capacity. There is a need to develop our domestic R&D expertise and for that government support is required. The Government of India allocates a budget for scientific and technological (S&T) activity under an R&D fund. Private sector has failed to make significant contribution to India’s R&D activities which are primarily driven by government. There is a poor industry-academia interaction which resulted in low orientation of India research and lack of technology inputs to industry. It is critical to Develop & restructure technology infrastructure to support firms striving to improve their technological capabilities and competitiveness to provide technology infrastructure to support industries that are striving to improve their technological capabilities and competitiveness. The government should also create “Centres of Excellence” by consolidating institutions that are working in similar areas. We should promote joint public-private sector R&D activities for better monitoring along with emphasis on international cooperation between R&D institutes and build linkages for technology development and transfer. Moreover government would have to direct emphasis towards adequate financial support and fund availability for those willing to invest in manufacturing sector. All these areas would require further liberalization under a strong, dependable, but enlightened regulatory regime. Private capital is the key here together with world-class standards of governance. Public private partnerships should be encouraged as a policy for infrastructure development. Moreover government should consider developing industrial hubs by providing all the necessary infrastructural support based on availability of resources. Development of SEZs is a step in right direction and such hubs need to be encouraged. However, if building a world-class infrastructure in India is truly to be a priority of the first order, there are two obvious conditions that must be met. One is overriding clarity of purpose. The other is courageous political leadership dedicated to accomplishing the mission. These two preconditions with efficient implementation is the key to development of world class infrastructure that would support the manufacturing sector in India.